Harold's Revenge: The Paint Arrived! My emergency order of Army Painter Leather Brown arrived by courier this morning! So not only was I able to progress the remaining three points of Vikings by painting their clothing and play not one but two games of Zombicide with Kyle and one of his mates, but... 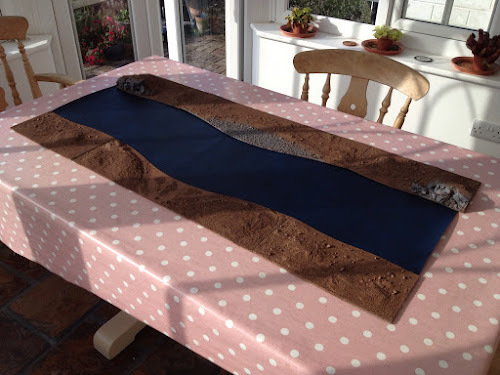 I was also able to spray the base colour of the river banks. And all before Doctor Who! The sun was a bit bright in the conservatory so not the best of photos, but you get the idea. Once the base coat was applied I even managed to give the cliffs and pebble beach a wash with black/brown. On most of my terrain bases I would apply a wash to all of the base. But I don't think its worth doing with such large pieces like this.